Combining their love for all things fashion and food, Tart London was founded in 2013 by Lucy Carr-Ellison and Jemima Jones. Catering on shoots for the likes of Stella McCartney and Vogue, here they share their favourite seasonal ingredients, a delicious festive recipe and some Cats vs Christmas tree stories. Your food always looks really beautiful, is that influenced by your love of fashion and photography or is there more to it? We care very much about the presentation, concentrating on colour, texture and flavour – it’s one of the most important things to think about when menu planning, from an individual dish to the whole spread. You’re big fans of seasonal food, what are your favourites for the holiday season and why? Love a parsnip – the ‘marmite’ of root vegetables. A vegetable that is very much related to a roast and not much else. It’s actually very versatile and you can even use it in baking – goes well in a banana bread, believe it or not. 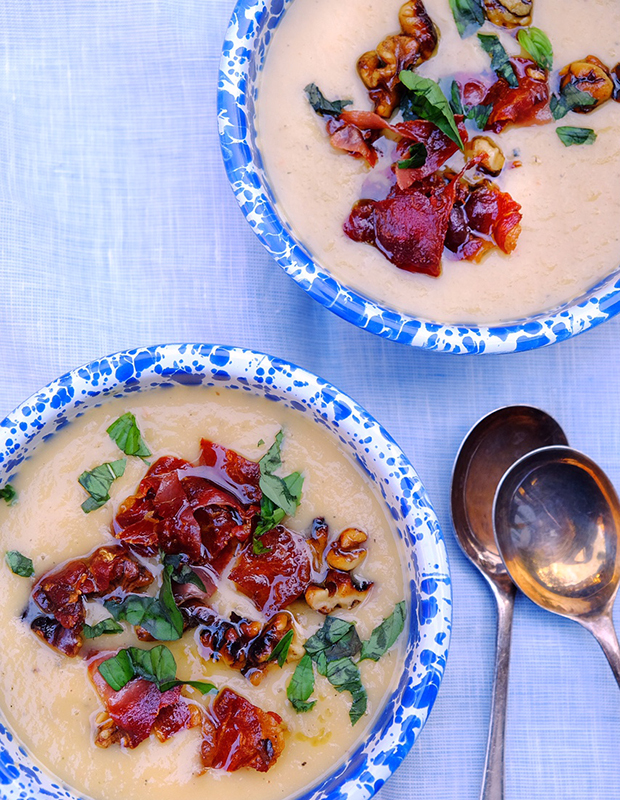 We have a few different soup recipes – the fav being roasted with chilli and garlic, then topped with goats curd and crispy pancetta. What are the most important ingredients for the perfect Christmas party? Cocktails, music and high heels! Is there such a thing as a healthy Christmas dinner? Or is Quality Street a must? Over-indulgence is a must – too much champagne and chocolates, always helped with a blast of cold air on a good walk. I don’t however see Christmas dinner as unhealthy – you’re getting your 5-a-day in one meal, if you help yourself to all the sides. What is the one dish that says ‘Christmas’ to you? A large roasted ham beautifully studded with cloves and mulled wine. Lucy, you had a cat growing up, can you please tell us about her? She was a wonderful fat cat called ‘Fluffy’ who I loved dearly, we were great friends and she often brought me gifts: one time, I found a live mole in my room – unfortunately she was mean to everyone else, so I was the only one that liked her. Cats often see a Christmas tree as a challenge and are known to knock them over, has your cat ever tried to destroy yours? Or disrupt the gift wrapping? Yes, it’s happened to Lucy twice – once on Christmas Eve, just as we were running out to a drinks party and and another time on Christmas Day! She jumped up to grab a bauble and the whole tree came crashing down which we found rather amusing – my parents on the other hand did not. Preheat the oven to 200°C . Roughly chop the parsnips, leek, garlic, chilli and put on a baking tray with the thyme, drizzle of olive oil and salt and pepper. Roast for about 30 mins until starting to caramelize. Take out of the oven and leave to cool slightly, then blend until smooth. Pour the glass of wine into a pan and bring to the boil, add the stock, then the parsnip mixture and simmer for a few minutes, season. For the topping, roughly tear the prosciutto and fry with the walnuts until crisp. Divide the soup between warm bowls, sprinkle the topping and parsley.